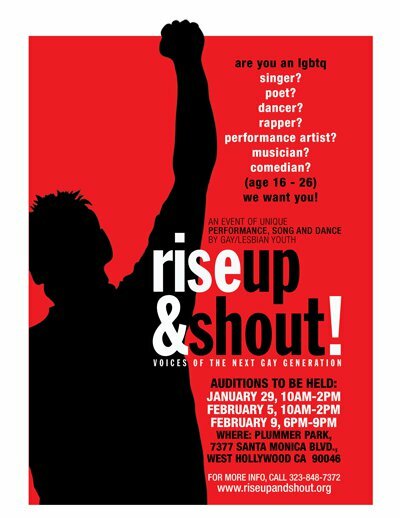 Rise Up and Shout!, a cultural activism project, needs your voice. Are you a young LGBT artist with something to say? A poet screaming for justice? A dancer moving for greater equality? A filmmaker showing the beauty and special gifts that gay people have to give? We need you. Rise Up and Shout! brings together young LGBT artists with community elders to create an original dialog: a series of workshops, rehearsals and one-one meetings that results in a unique performance event, a voices of our youth to the community, a welcoming and blessing of the gifts of the next generation. This year’s event is scheduled for March 16, 2013. We need to meet you now, to start the dialog, to begin building the kind of community we want to live in, and to help put your voice out into a world that badly needs it. Interested? Angry? Creative? Revolutionary? Set up an audition by filling out our contact form using the category of “Auditions” or calling 323-848-7372. Plummer Park, 7377 Santa Monica Blvd, WeHo in rooms 5 and 6. Lots more info on the program’s website.